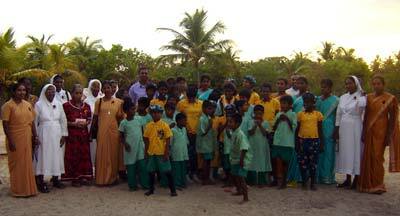 Staff and pupils at Ozanam Home, Batticaloa. The Ozanam Centre dining area needs renovation. There are few, if any, special facilities at Ozanam. Photo of the toilet that children with physical disabilities have to use. 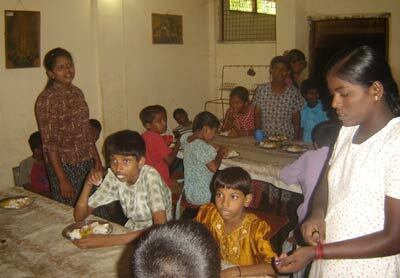 Ozanam Centre for Those Who Need Special Care is situated in the quiet Sathurkondan village, which is about five kilometres from Batticoloa town on the East Coast of Sri Lanka. Rt. Rev. Lord Anthony founded the Centre in 1981 and the present bishop Rt. Rev Dr. Kingsley Swampillai oversaw the completion of the Centre in 1986. The Home is run by five Sisters. 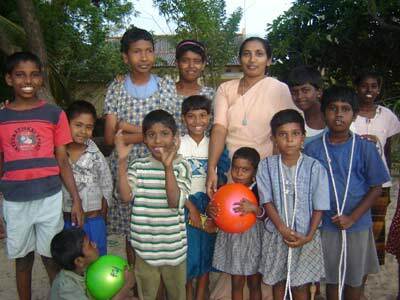 Sister Regina is the Sister Superior and Sister Selvarani is responsible for the welfare of the children. The Home which was initially set up to provide care for ten children currently cares for 34 children with disabilities. The majority of the children are girls, with seven boys currently staying at the Home. The needs of the children are varied with children with learning needs, autism, Downs Syndrome and impaired physical abilities been cared for by the Sisters. There are six girls whom are employed to look after the children day and night. As well as bathing, washing and feeding the children they teach the children life skills and offer them a basic level of education. The children are given the opportunity to learn to read and write as well as drawing and craft work. There are also daily Yoga sessions and children are taught relaxation techniques. 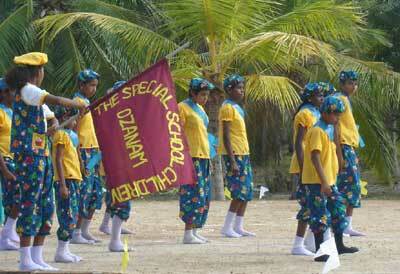 There is an annual Sports Day which the children participate in as well as a yearly trip. The children were recently taken to the beach on their trip. Additionally the children enjoy festivities such as concerts at Christmas and Easter. As well as the 34 children with disabilities the Sisters also provide care for 31-orphaned girls. Seven of these girls are of school age and frequent the local school. The older girls help with the cooking, growing vegetables, looking after the cows and chickens and general maintenance of the Home. The Sisters provide tuition to the girls who work and stay at the Home as they are not able to afford to continue with their schooling full time. Additionally, the girls are taught vocational skills such as sewing and knitting. The girls are encouraged to complete a six month sewing course which in completion they receive a sewing machine. This enables the girls to develop a trade that they are able to use to support themselves upon leaving the Home. The girls are taught how to grow vegetables and look after fruit trees, as well as looking after the chickens and the cows. A small income is received from selling the vegetables, fruit and eggs in the local market which is a necessary contribution towards the running cost of the Home. In the absence of regular donors the Sisters struggle to cater for the needs of the 72 children and teenagers that live, work and receive their education at the Home. They rely on kind contributions from donors to keep the Home running. Ozanam needs regular donors to contribute monthly or quarterly throughout the year in order to continue with the work that the Sisters are doing in looking after the children. Provide adequate toileting facilities for the children with impaired physical ability. Currently there are no adequate toilet facilities for the children with physical disabilities. 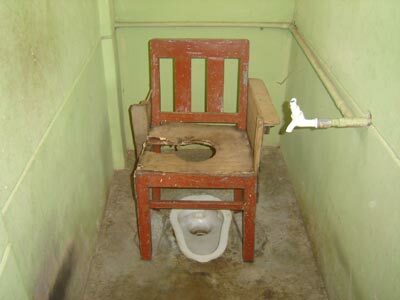 They have to use the squat toilets or a squat toilet with a chair put on top that has a hole cut out of it. The Home needs funding for one disabled toilet so that the children with impaired physical ability can use the toilet independently, hygienically and safely. Renovate the kitchen and the children's dinning area. There are now 72 children whom are looked after at Ozanam Home and the Sisters would like to be able to renovate and extend the dinning area to facilitate this amount of children. The girls whom are responsible for cooking for all the children and staff at the Home cook three meals a day on an open fire. The conditions in the kitchen are poor and the Sisters would like funding to be able to improve the kitchen. Provide a regular salary to the staff The girls who look after the children with disabilities work extremely hard, raising at 5.30am and taking care of the needs of the children all day until the children go to sleep at 9pm. From 9pm until midnight the girls will study for their O-level exams. The girls are responsible for bathing, toileting and feeding the children, as well as teaching and providing activities throughout the day. Many of the girls have no families to support them so the Sisters pay them a small wage of 2000Rp a month. The Sisters would like to be able to pay the staff a wage that they could live on independently and also save for their future. The Sisters feel that if the staff were paid a decent wage it would improve their sense of worth and increase their motivation to work with the children. This in turn would benefit the children who they look after. 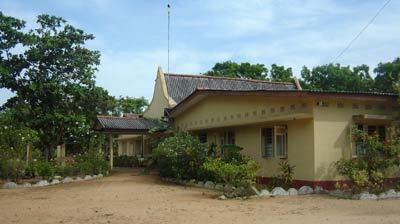 Build a House for the older residence so that they can live semi independently. There is no provision for adults with disabilities in Sri Lanka and often older people with disabilities will end up begging on the street or in a psychiatric Unit. To ensure that this fate does not occur to the students at Ozanam the Sisters have allowed residents to stay when they are over the age of 18. It is inappropriate that these older ladies are grouped together with children as young as 3 years old. There is one lady who is 42 years old but is still attending school and sleeping in a dormitory with the children. The Sisters would like to continue to care for these older ladies in a way that would suit their needs better. The hope is to build a house on the land of the Home so that these ladies can live semi-independently under the supervision of the Sisters. Funding is desperately needed to build a house for six ladies on Ozanam land. A carer would need to be employed to live with the ladies and help take care of their needs. This would not only meet the needs of these ladies but would also free up much needed space in the Home for the children. Staff, friends of and the students of Fleetwood High, UK organised a sponsored skip for staff and students, which took place on the 22nd of June 2005. From this they raised 150 pounds sterling. Anathi.org Project Catrin Roberts used part of the donation to to purchase toys, large soft balls and basket ball nets, which Ozanam children and staff are using to improve coordination and gross motor skills of the children. Catrin was careful to buy appropriate equipment for the needs of the children and bought large soft balls that the children are able to play with successfully and safely. The children who are visually impaired also benefited from these balls as they are large and brightly coloured thus attracting their attention. Catrin was able to demonstrate games and activities to the staff at the Centre using the balls and that were purchased with their donation.